Play Squad Podcast | Listen Free on Castbox. The Play Squad Podcast is SO MUCH MORE than ideas for play! Each episode we bring you a new person or message to help you unlock your child's superpowers, deepen your connection and TRANSFORM playtime at your place! In today’s episode Amy Cox chats with Amy Cambridge who is a mum of two really active little boys. Amy talks about how she loves adapting play ideas and suggestions with them in mind. And how you can cater for the different needs of your kids in an outdoor scene in every season. And then inside the home Amy chats about how she meaningfully involves her kids in the general running of the house in a playful way. And how it plays into developing her boys independence and confidence when they can learn to do things themselves - no matter how messy it can get in the process. SHARE THE LOVE! If you enjoyed this episode and it helped you in some way, we'd love to hear about it! Take a screenshot of you listening to this podcast and post it to your Instagram stories and tag @playfullittlelearners - we'd love to feature our listeners! LINKS: Connect with Amy Cambridge on Instagram @thehouseworkcanwait Grab your Free Playroom ebook on labels and toy storage tips at Playtime Hub. I’ve created a free hub of play ideas, recipes, eBooks, printables, favourite stores and so much more over at Playtime Hub. Join the next Play Squad Membership here. CONNECT WITH AMY: Web: www.playfullittlelearners.com Instagram: @playfullittlelearners Facebook: @playfullittlelearners Email: amy@playfullittlelearners.com LOVE THESE PODCASTS? Podcast reviews are super important to iTunes - we would be so grateful if you could share the love! The more reviews we receive, the better our reach will be - which means that our content can connect more people with our experts, helping them brighten their days with young children - and of course - help more families get PLAYFUL! If you’ve loved this podcast, never miss another one! All you have to do is SUBSCRIBE to the Play Squad Podcast on iTunes. BIG SMILES and happy playing! We are so thrilled to welcome the wonderful Maggie Dent to the show to dive into some of the things she’s written in her fabulous book, 9 Things, which is all about common sense parenting. Listen in as Maggie shares: The difference between roosters and lambs temperaments in children, the characteristics of each one and how to help them as a parent. How it's our challenge to work out how you fill each of your children's love cups up. What is it that makes them feel that you love them - that’s what you have to work out. The Five Love Languages book and how it can help relationships between parents and with your children. How we, as parents, try and give love the way we feel love. Embrace the 80/20 parenting rule: aim for about 80% of the time getting everything pretty much okay. But 20% of the time, you might end up with a high quality cereal for dinner or toasted ham, cheese, tomato sandwiches. The difference between men and women and how they each deal with ‘imperfect parenting’. Teaching our kids about big ugly feelings, talking about them and knowing that conflict is a normal part of human relationships. That it’s not wrong or bad. Tips on how to prime our children for the refusal that’s going to come - like buying a lolly at the supermarket. Why prioritising movement of any kind, being outside and getting fresh air is a restorative thing for our children. The best playgrounds aren’t actually the ‘safe’ playgrounds themselves but nature play in parks with big trees, nooks, crannies and sticks where they can explore and engage in nature around them. The challenge for parents today is to remember that the key ingredients to raising capable, resilient children is to give them as much freedom and autonomy to move their bodies in their world around them. That it’s the simple things that make a difference like fresh air, natural light and the freedom to run and move. SHARE THE LOVE! If you enjoyed this episode and it helped you in some way, we'd love to hear about it! Take a screenshot of you listening to this podcast and post it to your Instagram stories and tag @playfullittlelearners - we'd love to feature our listeners! LINKS: Connect with Maggie on her website, Instagram, Facebook, Twitter and YouTube. Books mentioned in the podcast: 9 Things by Maggie Dent, The Five Love Languages of Children by Dr. Gary Chapman and Dr. Ross Campbell. Grab your Free Playroom ebook on labels and toy storage tips at Playtime Hub. I’ve created a free hub of play ideas, recipes, eBooks, printables, favourite stores and so much more over at Playtime Hub. Join the next Play Squad Membership here. CONNECT WITH AMY: Web: www.playfullittlelearners.com Instagram: @playfullittlelearners Facebook: @playfullittlelearners Email: amy@playfullittlelearners.com LOVE THESE PODCASTS? Podcast reviews are super important to iTunes - we would be so grateful if you could share the love! The more reviews we receive, the better our reach will be - which means that our content can connect more people with our experts, helping them brighten their days with young children - and of course - help more families get PLAYFUL! If you’ve loved this podcast, never miss another one! All you have to do is SUBSCRIBE to the Play Squad Podcast on iTunes. BIG SMILES and happy playing! Welcome to the Play Squad Podcast's first episode for 2019! Today, Amy speaks about some top tips for creating a space to play for your kids, revealing what has worked for her family. SHARE THE LOVE! If you enjoyed this episode and it helped you in some way, we'd love to hear about it! Take a screenshot of you listening to this podcast and post it to your Instagram stories and tag @playfullittlelearners - we'd love to feature our listeners! LINKS: Join the free hub of play ideas, recipes, eBooks, printables, favourite stores and so much more over at Playtime Hub. Join the next Play Squad Membership here. CONNECT WITH AMY: Web: www.playfullittlelearners.com Instagram: @playfullittlelearners Facebook: @playfullittlelearners Email: amy@playfullittlelearners.com LOVE THESE PODCASTS? Podcast reviews are super important to iTunes - we would be so grateful if you could share the love! The more reviews we receive, the better our reach will be - which means that our content can connect more people with our experts, helping them brighten their days with young children - and of course - help more families get PLAYFUL! If you’ve loved this podcast, never miss another one! All you have to do is SUBSCRIBE to the Play Squad Podcast on iTunes. BIG SMILES and happy playing! Today, Amy chats to Anna from The Imagination Tree. Anna shares her journey as a Mum and the joy she - and her children- have discovered though play. Anna is a Mum of four, Early Childhood teacher and the amazing owner and creator of both The Imagination Tree & The Kindness Elves. SHARE THE LOVE! If you enjoyed this episode and it helped you in some way, we'd love to hear about it! Take a screenshot of you listening to this podcast and post it to your Instagram stories and tag @playfullittlelearners - we'd love to feature our listeners! LINKS: Join the free hub of play ideas, recipes, eBooks, printables, favourite stores and so much more over at Playtime Hub. Join the next Play Squad Membership here. CONNECT WITH AMY: Web: www.playfullittlelearners.com Instagram: @playfullittlelearners Facebook: @playfullittlelearners Email: amy@playfullittlelearners.com LOVE THESE PODCASTS? Podcast reviews are super important to iTunes - we would be so grateful if you could share the love! The more reviews we receive, the better our reach will be - which means that our content can connect more people with our experts, helping them brighten their days with young children - and of course - help more families get PLAYFUL! If you’ve loved this podcast, never miss another one. All you have to do is SUBSCRIBE to the Play Squad Podcast on iTunes. BIG SMILES and happy playing! In today’s episode, Amy chats with Lauren from Teacher Types. Lauren is an Aussie teacher, Mum of two gorgeous children and a blogger. They discuss Lauren’s best top tips for helping children start and transition smoothly into school. SHARE THE LOVE! If you enjoyed this episode and it helped you in some way, we'd love to hear about it! Take a screenshot of you listening to this podcast and post it to your Instagram stories and tag @playfullittlelearners - we'd love to feature our listeners! LINKS: Connect with Lauren Teacher Types, Instagram @teacher_types and Facebook Letter of the Day Brand Ambassadorship with Teach Starter. Join the free hub of play ideas, recipes, eBooks, printables, favourite stores and so much more over at Playtime Hub. Join the next Play Squad Membership here. CONNECT WITH AMY: Web: www.playfullittlelearners.com Instagram: @playfullittlelearners Facebook: @playfullittlelearners Email: amy@playfullittlelearners.com LOVE THESE PODCASTS? Podcast reviews are super important to iTunes - we would be so grateful if you could share the love! The more reviews we receive, the better our reach will be - which means that our content can connect more people with our experts, helping them brighten their days with young children - and of course - help more families get PLAYFUL! If you’ve loved this podcast, never miss another one! All you have to do is SUBSCRIBE to the Play Squad Podcast on iTunes. BIG SMILES and happy playing! Today, Amy shares her top tips for setting up playful invitations at home. She shares how it is NOT about the 'picture perfect' image - but more importantly, creating realistic expectations. Amy shares her experiences with her own four children and the learning curves they have gone through. SHARE THE LOVE! If you enjoyed this episode and it helped you in some way, we'd love to hear about it! Take a screenshot of you listening to this podcast and post it to your Instagram stories and tag @playfullittlelearners - we'd love to feature our listeners! LINKS: Join the free hub of play ideas, recipes, eBooks, printables, favourite stores and so much more over at Playtime Hub. Join the next Play Squad Membership here. CONNECT WITH AMY: Web: www.playfullittlelearners.com Instagram: @playfullittlelearners Facebook: @playfullittlelearners Email: amy@playfullittlelearners.com LOVE THESE PODCASTS? Podcast reviews are super important to iTunes - we would be so grateful if you could share the love! The more reviews we receive, the better our reach will be - which means that our content can connect more people with our experts, helping them brighten their days with young children - and of course - help more families get PLAYFUL! If you’ve loved this podcast, never miss another one! All you have to do is SUBSCRIBE to the Play Squad Podcast on iTunes. BIG SMILES and happy playing! In this episode (recorded at the end of 2017), Amy speaks with Brianna from Notes From A Home Educator (now Teacher with a Toy Shop). Brianna is a teacher, turned at home educator to four amazing boys. Brianna’s journey searching for products that met the individual needs of the boys in her care lead her to opening The Creative Toy Shop. SHARE THE LOVE! If you enjoyed this episode and it helped you in some way, we'd love to hear about it! Take a screenshot of you listening to this podcast and post it to your Instagram stories and tag @playfullittlelearners - we'd love to feature our listeners! LINKS: Connect with Brianna on Facebook, Instagram @teacherwithatoyshop The Creative Toyshop, Facebook, Instagram @thecreativetoyshop The Creative Toyshop VIP Group Join the free hub of play ideas, recipes, eBooks, printables, favourite stores and so much more over at Playtime Hub. Join the next Play Squad Membership here. CONNECT WITH AMY: Web: www.playfullittlelearners.com Instagram: @playfullittlelearners Facebook: @playfullittlelearners Email: amy@playfullittlelearners.com LOVE THESE PODCASTS? Podcast reviews are super important to iTunes - we would be so grateful if you could share the love! The more reviews we receive, the better our reach will be - which means that our content can connect more people with our experts, helping them brighten their days with young children - and of course - help more families get PLAYFUL! If you’ve loved this podcast, never miss another one. All you have to do is SUBSCRIBE to the Play Squad Podcast on iTunes. BIG SMILES and happy playing! Welcome to the very first episode of the Play Squad Podcast! Join your host Amy Cox, Aussie Mum of four and teacher-turned-entrepreneur on a mission to champion play in the early years of children’s lives. In this episode, Amy introduces herself and we learn about how the Play Squad Podcast came to light. 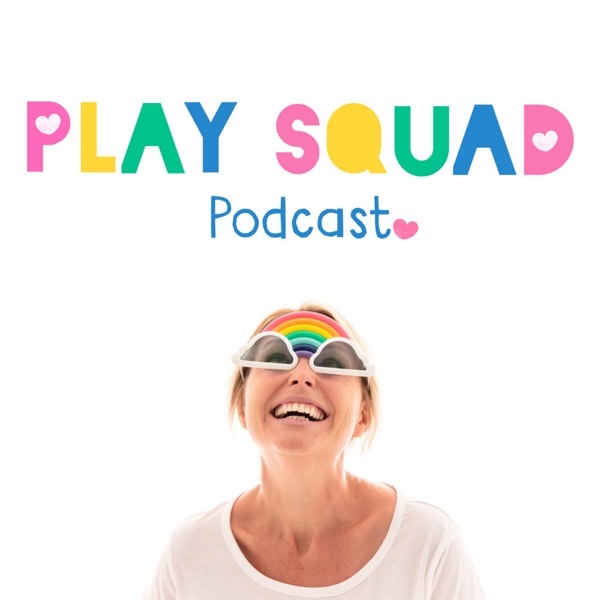 Amy shares her own personal journey, the three goals for the Play Squad Podcast, and starts the discussion on real and raw conversations around PLAY. SHARE THE LOVE! If you enjoyed this episode and it helped you in some way, we'd love to hear about it! Take a screenshot of you listening to this podcast and post it to your Instagram stories and tag @playfullittlelearners - we'd love to feature our listeners! LINKS: Join the free hub of play ideas, recipes, eBooks, printables, favourite stores and so much more over at Playtime Hub. Join the next Play Squad Membership here. CONNECT WITH AMY: Web: www.playfullittlelearners.com Instagram: @playfullittlelearners Facebook: @playfullittlelearners Email: amy@playfullittlelearners.com LOVE THESE PODCASTS? Podcast reviews are super important to iTunes - we would be so grateful if you could share the love! The more reviews we receive, the better our reach will be - which means that our content can connect more people with our experts, helping them brighten their days with young children - and of course - help more families get PLAYFUL! If you’ve loved this podcast, never miss another one! All you have to do is SUBSCRIBE to the Play Squad Podcast on iTunes. BIG SMILES and happy playing!